American Transmission Company (ATC) needed to replace more than 100 K-frame structures with steel H-frame poles that supported a 345kV line. 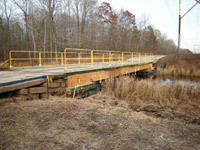 Much of the work was to take place on a 1.6-mile stretch of wetland, heavily protected by state DNR mandates and accessed only via private property. 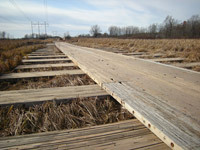 The wetland's depth meant the utility could not use conventional timber mats which are normally employed in this situation. 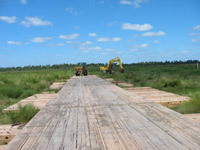 Given the deep and soggy soil conditions in the Bear Creek Marsh, crews would have had to stack the mats at least 10 deep to build a temporary road strong enough to support the heavy equipment. Even if the company had wanted to spend that much money on 20,000 mats, the weight of all those mats would have submerged the road — making work impossible and negatively impacting the marsh's endangered wildlife. Earthsafe & emtek™ devised another solution — an engineered floating mat system design called an “air bridge” that would support up to 190,000 pounds. 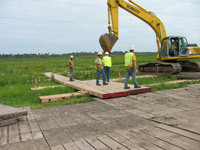 Using cranes and loaders, crews set out mats singly, so no piece of construction equipment was ever on the wetland. 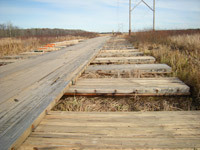 The support mats were placed perpendicular to the main road decking, allowing the weight of the machinery to be dispersed across a large area. 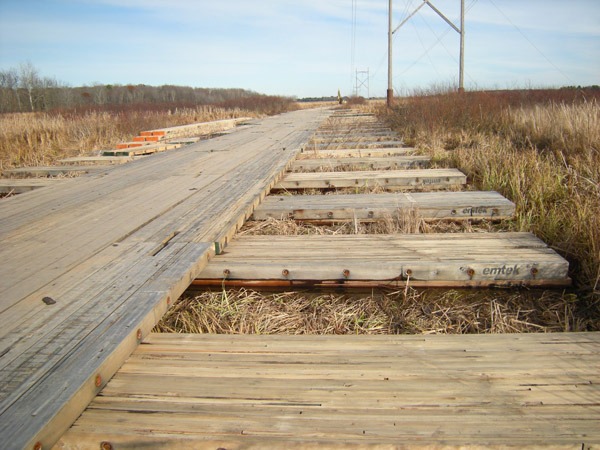 The road deck mats rest on those foundation mats, allowing the road deck to actually float on the wetland's vegetative layer, providing virtually no adverse impact to the wetland ecosystem. What's more, the RFID/GPS chips embedded in each mat allowed ATC to confidently inform regulatory officials that no materials had been left behind. New South customer Latchco Construction had a problem: They needed to be able to drive 200,000-pound wheeled axle loads across 600 feet of marsh-and-swamp right-of-way near the Gulf of Mexico for a drilling rig installation. The real catch? The space was lined with side-by-side, highly sensitive pipelines. Thirteen of them to be exact. Latchco called New South for help, beginning with an access design consultation. 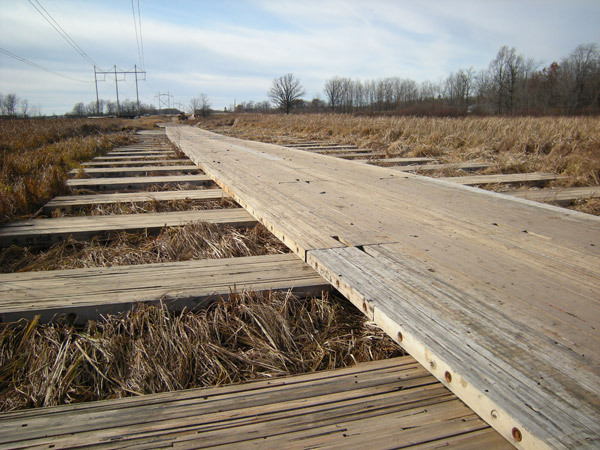 Strict downpressure requirements eliminated traditional hardwood mats as an option and made safety certification of this access road mandatory. In solving the problem, the New South team (consisting of Earthsafe & emtek™ engineers) designed an “airbridge” that left an air pocket between the ground and the access mats to match the specified ground pressure requirements for each piling and pipeline crossed. Turns out, the problem was well worth solving. The Duncan prospect hit oil. 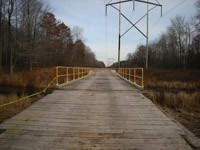 And now the airbridge is permanently in use as the access road to the active oil well. Is there a single system that enables you to cross waterways, bodies of water and sensitive environments – all with no impact? Yes. Whether it’s an 80’ clear span bridge or a 200’ bridge across a lake or pond, our EarthSafe bridging solutions provide heavy loading and safe access in all environments. Certified access loads up to 250,000 lbs. can be delivered through the emtek™ product. EarthSafe & emtek™ bridging can even provide access to bridge over existing bridges or crossings that do not meet your load requirements, thereby allowing your equipment and materials safe and effortless access for your project without damage to a less-than-load-worthy structure. Each bridge access project employs seasoned New South access professionals and engineers to evaluate your specific site conditions, load criteria and project schedule, and then provide you a specific bridging solution for your project.